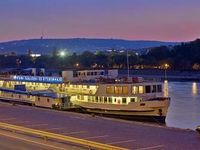 Stay with us near to the city center of Budapest, next to Margharet Island in the 3 star category Fortuna Boat Hotel*** & Restaurant! Calm and pleasant accommodation in the heart of the Hungarian capital - pleasure is guaranteed! The Danube, the nature and the boat together provide an unforgettable experience. We offer two kind of accommodations in different categories,: 3 star hotelrooms (quality: superior and standard) or hostel rooms (single, twin, triple) for backpackers and thrifty travellers. For the health and comfort of our guests, Fortuna Boat Hotel*** & Restaurant is non-smoking, including all rooms and public areas. During your stay try our Lord Nelson Restaurant with delicious Hungarian and International meals. Grill Terrace: You can enjoy the taste and magic of the riverbank on our grill terrace from June. You can choose from a wide selection of dishes from the pan, salads, and pastries made according to home style recipes. Our hotel offers special packages and programs for groups. We arrange boat-tours, Budapest sight-seeing tours or Gala dinners for groups upon request. • Breakfast is not included in room rates. It is available at 8 EUR per person. • Wired Internet access is available in some rooms. • The hotel has no own parking lot. The hotel will ask you to pay 30% non refoundable deposit upon your booking. The hotel will contact you concerning this deposit. 15 sq m elegant and quiet rooms with central airconditioning, writing desk, minibar and satellite TV (UPC programs) and bathroom with shower. 15 sq m, elegant and quiet rooms with central airconditioning, writing desk, minibar and satellite TV (UPC programs) and bathroom with shower. Quiet rooms with wash-basin. Separate bathrooms with showers located on the corridor. Quiet rooms with center airconditioning and wash-basin. Separate bathrooms with showers located on the corridor. • Rates exclude tourist tax (4%).